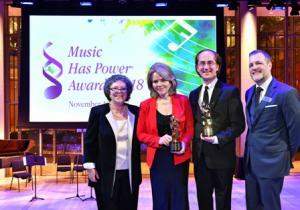 The Institute for Music and Neurologic Function (IMNF), a non-profit organization dedicated to advancing scientific inquiry into music and the brain, and developing clinical treatments to benefit people of all ages, hosted the Music Has Power Awards after a three-year hiatus. Held at the Times Center on Nov. 19,2018, IMNF honored Opera great Renée Fleming and IMNF Board member Harry Ballan. Renée Fleming, one of the most highly acclaimed singers of our time, was honored for her role in launching a collaboration between the Kennedy Center for the Performing Arts and the National Institutes of Health on music, wellness, and the brain. IMNF also honored Dean of Touro Law Center and IMNF Board member Harry Ballan for his support to the Institute. Emceed by former PBS broadcaster Midge Woolsey, the Music Has Power Awards began with a cocktail reception and then moved into the beautifully appointed theater for performances by Orpheus Chamber Orchestra, mezzo soprano J’Nai Bridges and pianist Gordon Schermer. Funds raised through this celebration will support patient care along with clinical and scientific research. The award given to honorees was designed specifically for IMNF. Past recipients have been physicians, scientists, musical artists, performers, and members of the music industry and business community. The event recognizes the accomplishments of exceptional individuals who have brought new understanding to the use of the power of music to awaken and heal. Celebrity performers have graced the stage at previous Music Has Power Award ceremonies to honor these individuals. Past celebrity performers include Chris Martin, Dominic Chianese, the Beastie Boys, Michael Feinstein, Jim McNeely, Dustin Hoffman, Moby, Vanessa Carlton and Kris Kristofferson. “I was always kind of interested in the music and the mind...and started working as a consultant with the Kennedy Center. We want to understand the brain, it is the only activity, bar none, that affects a huge amount of the brain at one time," Fleming said from the podium at the event. "I am really loving this journey and it is an honor and a privilege to be associated with this extraordinary work. In fact, what [Dr. Tomaino] said when I visited [Wartburg] was with the amount of therapy she is working on and able to provide she is finding that patients with dementia are really able to maintain that sense of self in memory. This is our future and I want more people to know about it. I am very proud and thankful to receive this honor." The IMNF is a not-for-profit, 501(c)(3) organization. Founded in 1995, the IMNF is driven by over 35 years of clinical observations on the actual effects of music on individuals who have different types of physical and neurological disorders. Directed by renowned music therapist Dr. Concetta M. Tomaino, the IMNF conducts research on the relationship between music and the brain, provides patients with music therapy, and offers our professional peers around the world the latest music therapy education and training information about best practices. Through the scientific exploration of music and the brain, the IMNF seeks to establish new knowledge and to develop more effective music therapy treatments to awaken, stimulate and heal through the extraordinary power of music. Wartburg, located in Westchester County, NY, offers integrated, comprehensive senior residential and healthcare services. Unlike conventional retirement communities, Wartburg provides a wide range of services to both residents living on its beautiful 34-acre campus and people in their own homes. From independent, assisted living and award-winning nursing home care to inpatient/outpatient rehabilitation, home care and adult day care services, its continuing care approach has earned Wartburg a trusted reputation in Westchester. Wartburg also provides caregiver support at every stage with an array of options to find the level of care that considers the whole family. Wartburg was named one of the "Best Nursing Homes in New York State" by U.S. News & World Report for the ninth consecutive year in 2019. Sopranos Star, Dominic Chianese, Gives Personal Performance at Wartburg's "Music Under the Stars"